Mom's Media Manual: Spellbound, the divided eye, and Baudry's dream screen. Spellbound, the divided eye, and Baudry's dream screen. However, the film proceeds to treat psychoanalysis somewhat flippantly, and there are no remotely realistic representations of the practice within the film. 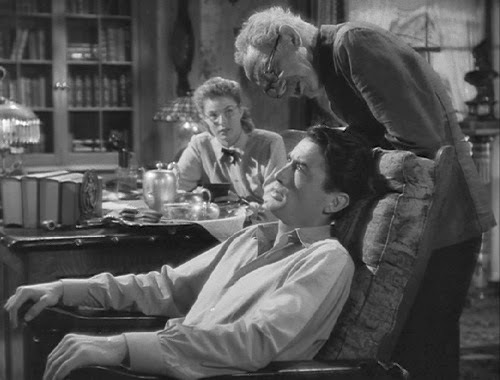 As Hitchcock insisted when these incongruities were objected by the advising psychoanalysts, “My dear, it's only a movie.” If the film does not, in fact, explore psychoanalysis with any depth, it does at length plumb the depths of the Oedipal fantasy and Oedipal guilt complex. But with rather clumsily constructed characters, how does this Oedipal exploration work? It would appear that this narrative relies heavily upon the division between reality and perception, as much in the viewer’s phenomenological experience as in the experiences of characters within the plot. The idea of division is rife in the film, with overt binaries between old and new practices, between youth and old age, parents and children, conflicting identities, conflicting female roles, agency and fate, material reality and psychical reality, and the conscious and the subconscious. Ultimately all of this division points to the division between the desire within the text, and the desire of the text, and how the film ultimately becomes about the latter rather than the former. Spellbound came to be made largely out of producer DavidSelznick’s own experience with psychoanalysis and his desire to make a movie about it. Psychoanalysis went on to become a popular plot device in suspense films later in the 1940s, but in this case its use was innovative. He purchased rights to the novel, The Houseof Dr. Edwardes, and hired his own psychoanalyst, May Romm, to advise Hitchcock. 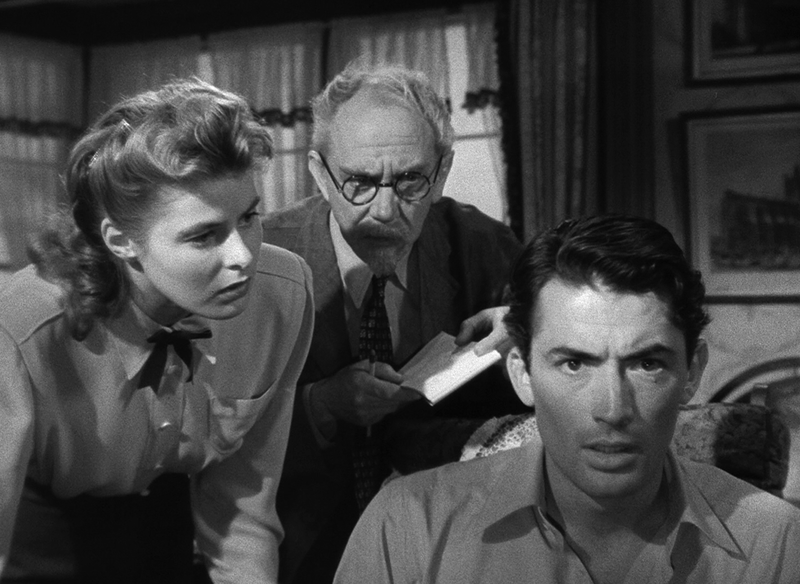 Hitchcock and Selznick appear to have had fairly incompatible visions for the film though, and their dissonance over this film irreparably damaged their working relationship. Selznick (and film censors) appears to have insisted on the removal of the bulk of the dream sequence designed by surrealist Salvador Dali, leaving only what was necessarily for plot propulsion. 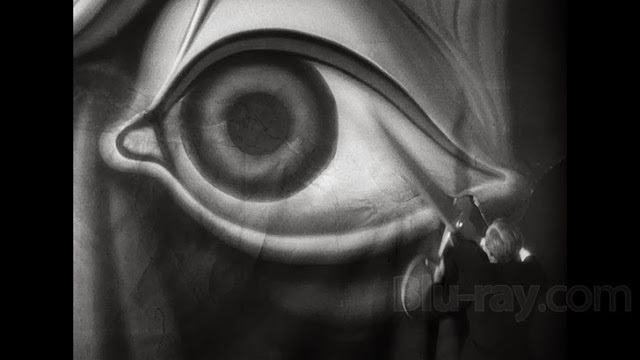 The images of multiple eyes, and of the pair of scissors cutting through an eye are the only strong surrealist images that remained, and they are appreciably symbolic of the duality inherent in the film. The film, or rather it’s score by MiklósRózsa also pioneered the use of the Theremin in the score. (See: Spellbound Concerto, approx 4:22-7:55) The instrument is played without actually touching the device, and the pitch alters based on the proximity of the instrumentalist’s hands to it. By adding this unfamiliar instrument to scenes involving dreams or repressed memories, an uncanny effect is evoked, as what had seemed familiar in the score (always repeating motifs previously introduced) becomes unfamiliar when played on the theremin. The film plays with Baudry’s idea of double space of the subject. Both the conscious and unconscious are explored in the character first introduced as Dr. Edwardes, but who later turns out to be an amnesiac John Ballantine. The film is also, more subversively, playing with the conscious and unconscious of the viewer, providing them with the “desire of desire” by fulfilling Ballantine’s Oedipal fantasy. The film opens with the pretense that Dr. Edwardes is arriving to take the helm at Green Manors, a psychiatric inpatient hospital. The current director, Dr. Murchison, is being forced into retirement by his own mental breakdown, from which he appears to have recovered. Dr. Constance Peterson, the only female psychoanalysis on staff, is firmly platonic and professional (even cold) in her interactions until the supposed Dr. Edwardes (John Ballantine) rather abruptly sweeps her off of her feet. She immediately abandons any semblance of professionalism and spends the rest of the film trying to cure his amnesia through psychotherapy and prove his innocence in the death of the real Dr. Edwardes. This was the first of Hitchcock’s films to question visual perspective, displacement, and guilt. He went on to explore these devices (arguably with more finesse) in Rear Window and Vertigo, both as cinematic devices and as subject matter within the films. Seeing him toy with it here is revealing. Despite the uncanny themes of Ballantines involuntary repetition of psychotic episodes whenever confronted with parallel lines or the color white, the film seems overwhelmingly designed to accommodate pleasure, rather than fear in the viewer. Baudry claimed that by it’s very nature cinema puts viewer into regressive, passive, oral, narcissistic state and that films are dream screens, like a mother’s breast for an infant after nursing. That cinema is inherently Oedipal, leaning toward a state of complete satisfaction parallel to the oral phase in infant development. By its repeated, overt oedipal references, this film seems rather self-aware of its function as a fantasy for its audience. Ultimately, it is not Ballantine, but rather the fantasy constructed for him that becomes the motivating force behind the action in the film. Ballantine himself is a rather passive character. He is more acted upon than active. This allows a viewer to split the vision of the film (as perhaps alluded to by Dali’s scissors?) and appropriate himself in the fantasy created for Ballantine. In this context, the bizarre behavior of Constance makes more sense. For a film that claims to be about psychoanalysis to portray a psychoanalysis behaving so contrary to her profession only makes sense if her character exists not to illustrate psychoanalysis accurately, but to satisfy the viewer’s oedipal fantasy completely. Her transition from a mother/caretaker to a romantic trope is inevitable in this context. Ultimately, and none-too-subtly, the film changes from being about the Oedipal issues of John Ballantine to being about the Oedipal fantasy of the viewer. There is a shift from desire as represented in the film to the desire of the film by the viewer. This is most clearly evidenced by Ballantine’s absence for nearly all of the sequences involving exposition or conflict resolution. After his arrest, Ballantine disappears from the film entirely, but the fantasy constructed for him remains and continues of its own volition for the viewer’s pleasure. This seems like an easy example of Baudry’s “Desire of Desire.” The viewer’s desire to see Ballantine’s fantasy completed becomes more important to the film than Ballantine’s own presence. “Symbol becomes merged with what it represents,” and Ballantine seems to represent the viewer’s fantasies. The film invites “transference of identification” from Ballantine’s experience within his cinematic world to the viewer’s own interaction with the entire fantasy.